USES: Simvastatin is used along with a proper diet to help lower \"bad\" cholesterol and fats (such as LDL, triglycerides) and raise \"good\" cholesterol (HDL) in the blood. It belongs to a group of drugs known as \"statins.\" It works by reducing the amount of cholesterol made by the liver. Lowering \"bad\" cholesterol and triglycerides and raising \"good\" cholesterol decreases the risk of heart disease and helps prevent strokes and heart attacks. In addition to eating a proper diet (such as a low-cholesterol/low-fat diet), other lifestyle changes that may help this medication work better include exercising, losing weight if overweight, and stopping smoking. Consult your doctor for more details. HOW TO USE: Take this medication by mouth with or without food as directed by your doctor, usually once daily in the evening. Dosage is based on your medical condition, response to treatment, age, and other medications you may be taking. Be sure to tell your doctor and pharmacist about all the products you use (including prescription drugs, nonprescription drugs, and herbal products). Chinese patients taking niacin may require lower doses of simvastatin. Ask your doctor for more details. The usual maximum dose for this medication is 40 milligrams a day. If you have been instructed by your doctor to take more than 40 milligrams, continue on that same dose. However, promptly talk with him or her about the risks and benefits of your higher dose. Do not increase your dose or take this medication more often than prescribed. Your condition will not improve any faster, and the risk of serious side effects may be increased. Avoid eating grapefruit or drinking grapefruit juice while using this medication unless your doctor instructs you otherwise. Grapefruit can increase the amount of this medication in your bloodstream. Consult your doctor or pharmacist for more details. Take this medication regularly in order to get the most benefit from it. Remember to take it at the same time each day. It is important to continue taking this medication even if you feel well. Most people with high cholesterol or triglycerides do not feel sick. It is very important to continue to follow your doctor\'s advice about diet and exercise. It may take up to 4 weeks before you get the full benefit of this drug. SIDE EFFECTS: Remember that your doctor has prescribed this medication because he or she has judged that the benefit to you is greater than the risk of side effects. Many people using this medication do not have serious side effects. A very small number of people taking simvastatin may have mild memory problems or confusion. If these rare effects occur, talk to your doctor. Rarely, statins may cause or worsen diabetes. Talk to your doctor about the benefits and risks. This drug may rarely cause muscle problems (which can rarely lead to very serious conditions called rhabdomyolysis and autoimmune myopathy). Tell your doctor right away if you develop any of these symptoms during treatment and if these symptoms persist after your doctor stops this drug: muscle pain/tenderness/weakness (especially with fever or unusual tiredness), signs of kidney problems (such as change in the amount of urine). This medication may rarely cause liver problems. If you notice any of the following rare but serious side effects, tell your doctor right away: yellowing eyes/skin, dark urine, severe stomach/abdominal pain, persistent nausea/vomiting. A very serious allergic reaction to this drug is rare. However, seek immediate medical attention if you notice any symptoms of a serious allergic reaction, including: rash, itching/swelling (especially of the face/tongue/throat), severe dizziness, trouble breathing. This is not a complete list of possible side effects. If you notice other effects not listed above, contact your doctor or pharmacist. In the US - Call your doctor for medical advice about side effects. You may report side effects to FDA at 1-800-FDA-1088 or at www.fda.gov/medwatch. In Canada - Call your doctor for medical advice about side effects. You may report side effects to Health Canada at 1-866-234-2345. PRECAUTIONS: Before taking simvastatin, tell your doctor or pharmacist if you are allergic to it; or if you have any other allergies. This product may contain inactive ingredients, which can cause allergic reactions or other problems. Talk to your pharmacist for more details. Before using this medication, tell your doctor or pharmacist your medical history, especially of: liver disease, kidney disease, alcohol use. Before having surgery, tell your doctor or dentist about all the products you use (including prescription drugs, nonprescription drugs, and herbal products). Limit alcoholic beverages. Daily use of alcohol may increase your risk for liver problems, especially when combined with simvastatin. Ask your doctor or pharmacist for more information. Older adults may be more sensitive to the side effects of this drug, especially muscle problems. This medication must not be used during pregnancy. Simvastatin may harm an unborn baby. Therefore, it is important to prevent pregnancy while taking this medication. Consult your doctor for more details and to discuss the use of reliable forms of birth control (such as condoms, birth control pills) while taking this medication. If you become pregnant or think you may be pregnant, tell your doctor right away. It is unknown if this medication passes into breast milk. Because of the possible risk to the infant, breast-feeding while using this drug is not recommended. Consult your doctor before breast-feeding. DRUG INTERACTIONS: See also How to Use section. Drug interactions may change how your medications work or increase your risk for serious side effects. This document does not contain all possible drug interactions. Keep a list of all the products you use (including prescription/nonprescription drugs and herbal products) and share it with your doctor and pharmacist. Do not start, stop, or change the dosage of any medicines without your doctor\'s approval. Some products that may interact with this drug include: \"blood thinners\" (such as warfarin), cyclosporine, danazol, gemfibrozil. Other medications can affect the removal of simvastatin from your body, which may affect how simvastatin works. Examples include certain azole antifungals (such as itraconazole, ketoconazole, posaconazole, voriconazole), boceprevir, cobicistat, colchicine, delavirdine, macrolide antibiotics (such as clarithromycin, erythromycin), nefazodone, HIV protease inhibitors (such as nelfinavir, ritonavir), telaprevir, telithromycin, among others. Do not take any red yeast rice products while you are taking simvastatin because some red yeast rice products may also contain a statin called lovastatin. Taking simvastatin and red yeast rice products together can increase your risk of serious muscle and liver problems. Simvastatin is a type of medication which is used to lower ‘bad’ cholesterol levels and triglycerides (types of fat) in the blood. Use of this medication, in conjunction with a healthy lifestyle, can lower the risk of heart attack, stroke and other heart complications in individuals with diabetes, coronary heart disease, or other heart related risk factors. 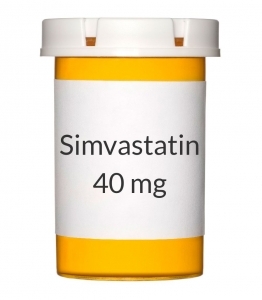 Simvastatin is a type of medication which belongs to a group of drugs called HMG-CoA reductase inhibitors, or "statins". Statins reduce low-density lipoprotein, or LDL levels (‘bad’ cholesterol) and triglycerides and increase levels of high-density lipoprotein, or HDL (‘good’ cholesterol) in the blood. The right Simvastatin dosage for you will be determined by your doctor. This medication is commonly prescribed to adults and children who are at least 10 years old. The Simvastatin cost or price will be determined by the dosage that you are prescribed. Simvastatin is used to reduce the amount of cholesterol made by the liver. This medication helps in lowering levels of ‘bad cholesterol’ and raising levels of ‘good cholesterol’. Simvastatin reduces the risk of heart disease, stroke, and heart attacks. Simvastatin works best with a healthy routine that includes a proper diet, exercise, weight loss, and quitting unhealthy habits like smoking. Simvastatin comes in the form of a tablet, meant to be taken orally, once a day. It is recommended that you take this medication around the same time every day. Do not take Simvastatin more or less than prescribed by your doctor. And do not stop taking it even if you begin to feel better. What are the side effects of Simvastatin? Some side effects, however, are very serious, and if you experience any one of them, call your doctor immediately and seek help. What precautions should I take before using Simvastatin? You can get Simvastatin at your local pharmacies or online pharmacies such as HealthWarehouse.com.